Two Russian journalists have been attacked, beaten and robbed during a radical torchlight march in central Kiev. Thousands took to the streets in the Ukrainian capital for the birthday anniversary of radical nationalist WWII leader. The rally was dedicated to Stepan Bandera, the figure which is officially banned in Russia as extremist. A reporter and a cameraman of LifeNews media outlet were attacked during the march. “Unknown people pushed the journalist, she fell and hit her head. Her phone was also stolen,” the statement by LifeNews said. The people took the TV camera, and broke it, too, the statement added. The incident happened right after the reporter went on air. Before that, the participants of the rally hadn’t shown any interest in the crew, reporter Zhanna Karpenko stressed. The attack took place in front of Kiev police, but the law enforcement didn’t interfere, she added. On Friday, Kiev law enforcement officers detained a man suspected of attacking Russian journalists, the Ukrainian Interior Ministry said in a statement. Deputy head of the Russian Foreign Ministry’s press department Maria Zakharova condemned the assault on the Russian journalists via Facebook post. "A new attack on Russian journalists is another glaring fact of press persecution in Ukraine,” Zakharova wrote. The attack she says is the manifestation of “gross violation of the fundamental principles of freedom of speech.” Zakharova blamed Kiev authorities for not providing safe work environment for the press, adding that the journalists asked for police help, but were sent away. The Foreign Ministry representative urged the international community and human rights group to speak out against harassment of the press and the spread of ultra-nationalism in Ukraine. "It is important that anti-fascist organizations have their say in the matter, because it is no longer about some dangerous neo-Nazi tendencies in the center of Europe, but specific activities that in form and content copy Nazi traditions. Silence in this case is an act of approval,” Zakharova said. All in all, the rally attracted about 2,000 people representing the Ukrainian radical right-wing movements, according to Interfax-Ukraine. 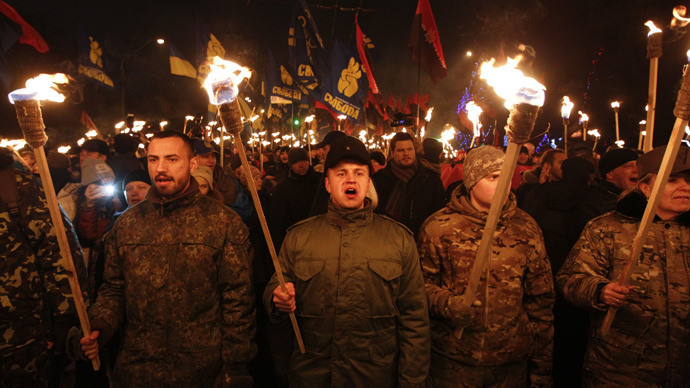 Some protesters wore World War II military uniforms, while others draped themselves in the red and black nationalist flags, chanting "Ukraine belongs to Ukrainians" and "Bandera will return and restore order." The march ended at Kiev’s Independence Square (Maidan) with leaders of radical Svoboda party and Right Sector group addressing the crowd. The Svoboda party leader said they are going to push for Bandera getting the title of Ukraine’s Hero. Similar marches but on a much lesser scale took place in the cities of Lvov and Dnepropetrovsk. Stepan Bandera collaborated with the Nazi German forces during the Second World War, but was later arrested by the Germans and spent years in a concentration camp. He is regarded as a highly controversial figure in the Ukrainian society. In 2010, President Viktor Yushchenko gave him the title of Ukraine’s Hero, but in the same year, the Donetsk administrative court canceled the decision, calling it unlawful.